If one discovered his Tallis in invalid, and he is in an area that there is no embarrassment involved in removing his Tallis, such as he is in a private area, then he must immediately remove his Tallis, whether it is a Tallis Gadol or Tallis Katan, and whether it is Shabbos or a weekday. If however one is in a public area, then there is a difference regarding Shabbos and weekday, public and private area, and during times of prayer in Shul. Tallis Gadol: If one discovered that the Tallis Gadol that he is wearing is invalid, he must to remove it [right away], even if he is in a public area such as the marketplace. If the Chazan discovered his Tallis is invalid in middle of Davening what is he to do? Seemingly, if he is very embarrassed to remove it in middle of Davening, he may continue to wear it until he completes the Davening. 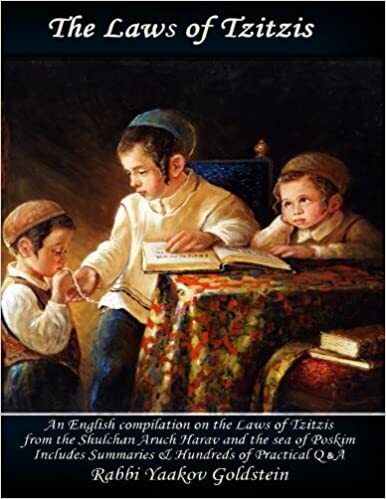 What is the law if in middle of a Drasha one notices that his Tallis is invalid? Must he stop the Drasha to remove it, or may he continue wearing it? Seemingly he may continue to wear it until he is able to complete his Drasha, if he is very embarrassed to stop in middle of the Drasha. If there are no Kosher Tzitzis strings available in the city, may one follow the leniencies brought next regarding Shabbos? Some Poskim rule that if there are no Tzitzis available in the city, then one may follow the Shabbos leniencies explained next. Other Poskim however rule that one may not follow the Shabbos leniencies, and the rules above remain fully intact. May one give his invalid Tallis as a present to another, or make it Hefker, and then continue to wear it without Kosher Tzitzis? No. However some Poskim rule that one may do so in a time of need, such as if one will be embarrassed to be without Tzitzis. While walking in a Reshus Harabim: If one discovered on Shabbos, while within a Reshus Harabaim, that his Tallis Gadol or Tallis Katan contains a Biblical invalidation, then he must remove his Tallis immediately. This applies even if as a result of removing the Tallis the person will be left naked in the public marketplace. Checking the Tzitzis prior to walking in an area without an Eiruv: One is not required to check his Tzitzis to verify their Kashrus status prior to walking through a Reshus Harabim, so long as the Tzitzis were already checked that day. If on Shabbos one discovered his Tallis in invalid and he is in an area that there is no embarrassment involved in removing his Tallis, such as he is in a private area, then he must immediately remove his Tallis, whether it is a Tallis Gadol or Tallis Katan. If however one is in a public area that is not Halachicly defined as a Biblical Reshus Harabim, then he does not need to remove it right away, and rather is to hurry home immediately [or to somewhere private] and remove it. This applies even by a Tallis Gadol. If however one is in a Biblical Reshus Harabim, then he must remove his Tallis Gadol/Katan immediately. If prior to Davening one discovered that his Tallis Gadol is invalid, then if he is embarrassed to Daven without a Tallis and he did not know of this invalidation before Shabbos, he may wear it without a blessing. What is the law if one discovered an invalidation on Yom Tov? It follows the same as Shabbos, with exception that there is no stringency to require to remove the Tzitzis if one is in a Biblical Reshus Harabim. Second day in Diaspora: Some Poskim rule one is not to initially rely on the above Shabbos leniencies and is rather to try to give the Tallis as a present to another person, and then re-wear it. If this is not possible then one who chooses to be lenient may do so. In an area that he is allowed to walk home and then remove his Tallis: If the Jew is found in an area in which he is not required to immediately remove the Tallis upon discovery of an invalidation, but is required to immediately walk home and remove his Tallis [such as by a Tallis Katan being worn during the week in a public area, or on Shabbos in a Karmalis or other non-Reshus Harabim public area, or a Tallis Gadol while Davening during the week] then the person who discovered the invalidation must inform his friend right away and tell him to quickly go home [or to another private area] and remove it. A disputed invalidation: Some Poskim rule that by a disputed invalidation there is no need to remove the Tzitzis right away or even hurry home, [whether by a Tallis Katan or Tallis Gadol]. This would include cases such as if the tear occurred in the braid, or more than two strings are torn but retain Kdei Aniva. [Kaf Hachaim 13/16] Accordingly, the only cases in which one would be required to remove the Tzitzis right away or return home is if: a) the entire Tzitzis tore off the corner; b) A tear occurred below the braid. C) Two strings tore so close to the first knot near the hole that they do not contain Kdei Aniva even according to Riy. However see Biur Halacha 13/3 “Vedavka” and “Aval”. Other opinions: Some Poskim rule that if there will not be a Minyan in Shul one may go to Shul and wear the Tallis without a blessing. [Reb Akiva Eiger on Michaber 13/3; Kaf Hachaim 13/10; See Tehila Ledavid 13/4 that it is implied from Admur that if there were to be a Gnaiy Gadol then one may wear it during Davening] See Piskeiy Teshuvos 13/4 footnote 36-37 for a full discussion on this opinion. See Reb Akiva Eiger 13/3 and Kaf Hachaim 13/10 that allows to even wear the Tallis even if he is not the Chazan, if he must Daven in Shul. These leniencies include a) Allowance to even initially wear the Tallis Gadol for Davening in Shul. And b) To not remove the Tallis Gadol when in a public area until one reaches home. M”A 13/8; P”M 13 A”A 8; Chayeh Adam 11/35; M”B 13/16; Poskim in Kaf Hachaim 13/12; The Kaf Hachaim ibid extends this so far that he permits one to wear a Tallis Gadol without Tzitzis for Davening in Shul even during the week if no Tzitzis are available at the moment that he needs to Daven, even if they are available in the city. Ruling of Admur: Admur in chapter 13/6 omits the above ruling of the M”A ibid and writes similar to the wording of the Taz which implies to negate the opinion of the M”A and hold stringently. However in 12/6 Admur rules like the M”A 12/7 that one may be lenient like the Riy if he does not have other Tzitzis available, and the P”M ibid explains the reason behind the M”A ibid ruling is because when one does not have Tzitzis it is only a Rabbinical prohibition, and by a Rabbinical prohibition one may be lenient. This is defined as all areas that a) do not have an Eiruv and b) Have 600,000 people pass through daily. A Karmalis is a domain in which the carrying prohibition is only of Rabbinical nature. [ibid] This is defined as all areas that a) do not have an Eiruv and b) are public and c) 600,000 people do not pass through it daily. Michaber ibid states “Tallis”; Rama ibid adds “even a Tallis Katan”; the M”A 13/7 based on Beis Yosef adds even Tallis Gadol; Admur ibid plainly states Tallis, and then states it applies to every type of Tallis. The reason: As carrying in a Karmalis, is only a Rabbinical prohibition and the Sages did not enact their decrees in a situation that will compromise on the respect of humanity. Now, although wearing a Tallis without Kosher Tzitzis is a Biblical prohibition, nevertheless on Shabbos there is no Biblical prohibition involved in doing so and it is rather a mere Rabbinical prohibition, [and hence regarding this Rabbinical prohibition we state that the Sages did not enact their decrees in a situation that will compromise on the respect of humanity]. Now, although a Tallis Gadol is only worn for the Mitzvah, and hence does not contain any embarrassment in its removal, nevertheless since the Sages did not decree for one to remove the Tallis Katan in a Karmalis, they did not desire to differentiate in their ruling between a Tallis Gadol and Katan in a Karmalis, and for this reason a decree was never made to remove garments in a Karmalis. [Admur ibid; M”A 13/7] By a Tallis Katan the actual removal is considered belittling of human dignity and hence even though its removal will not cause one to be left unclothed, it is nevertheless included in the original allowance of Kavod Habiryos. [Rama 13/3; M”A 13/7] Now, although earlier [in 13/4] Admur clearly differentiates between a Tallis Gadol and Katan while in a public area, this is because during the week there is a Biblical prohibition involved in wearing an invalid Tallis, and hence if there isn’t embarrassment involved the Sages must differentiate and cannot permit it. However on Shabbos, since the entire prohibition is only Rabbinical, therefore they can choose to be lenient and rule one never has to remove any invalid Tallis in a public area. Obviously, the above law applies even when walking in a public area that has an Eiruv, that one is not required to remove his Tallis, whether Gadol or Katan, being the Sages did not differentiate in their decree of Talleisim as explained above, and the reason the above law was written only regarding a Karmalis is just to teach an added novelty that even by a Karmalis the Sages did not decree to remove even the Tallis Gadol. Tehila Ledavid 13/4 Upashut! ; As the Sages allowance to continue wearing an invalid Tallis on Shabbos is only when the concept of “Kavod Habriyos” is relevant, in which case they did not decree against any Tallis, even if it does not involve Kevod Habriyos. However, when in a private area where the concept of Kavod Habriyos is irrelevant, certainly there is a Rabbinical prohibition involved in continuing to wear the Tallis. Derech Hachaim 8/2; M”B 13/16 and Kaf Hachaim 13/15 regarding even a Tallis Katan. Tzaruch Iyun as to which case Admur refers to. There are only two cases mentioned in which one is required to remove his Tallis immediately even if he is in public. One case is when wearing a Tallis Gadol in public during the week, and a second case is when wearing a Tallis Gadol or Katan on Shabbos in a Reshus Harabim. Now, if it refers to the former case, Admur 13/4 writes that there is absolutely no embarrassment involved in removing a Tallis Gadol in a public area, and hence why shouldn’t the friend be immediately informed about the invalidation. One must thus say Admur refers to the latter case, and specifically when wearing a Tallis Katan [and there is thus embarrassment to remove it in public] and accordingly it is permitted to not tell the Jew of the invalidation even though he is transgressing every four Amos a Biblical prohibition of carrying on Shabbos.